The Aztecs had various jobs and roles in society to perform that kept their great empire functioning. From the noble job of an Aztec priest who would have to sacrifice others to the gods as part of their role, to the simple but hard working Aztec farmers. Gender, economic class, talent and lineage often dictated the Aztecs jobs and their role in life. Some jobs were taught as a child or as a child’s desire to follow the footsteps of the parent. Others inherited trade because of a family business, and in other cases, recognized talent was honed to be developed in specialized schools. The Aztec nobility were able to go to advanced schools for higher education, and would often be trained to perform larger duties and could even one day be a great ruler of their society. At a certain age, Aztec boys were made to choose to learn a trade or to become a warrior. 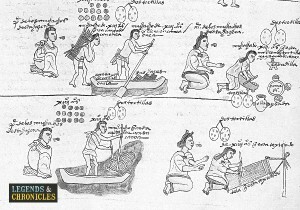 Men were involved mostly in farming as this is was the Aztec’s basic trade. Others young men would train to become priests, warriors, craftsmen or merchants, but the primary choices for a young Aztec male was either farming or fighting. Aztec Women on the other hand took part in taking care of the Aztec household, weaving clothes for their family and for selling. The young Aztec girls would also be trained and learn how to bring up and look after children, and take part in cooking and jewellery making. The fortunate wealthy Aztecs that controlled society in general enjoyed the spoils of the land and the privileges that were protected by law. They owned plentiful amounts of land and servants and were in command of the government. The tlatoani was the ruler, Tetecuhtin were the high lords and the Pipiltin were the regular lords. These aware the three ranks of the Aztec nobles and each had a different position, and role in the Aztec society. Priests and Priestesses were important nobles that had specific roles that affected the daily life of the Aztecs. They studied the cosmos, they planned and performed rituals and ceremonies during special events, they made offerings and sacrifices, and they even wrote codices and drew their own blood. The Priests and Priestesses would even go to war to provide help by listening to the confessions of the warriors. Additionally priests would also plan the daily activities of the Aztecs by interpreting the Sacred Calendar, and therefore provided a very important role in the Aztec society. Aztec warriors were the brave men who went to war for the Aztec Empire, their goal to defeat the enemies of the Aztec empire and break new ground for their people. The Emperor rewarded successful warriors and battles with important ranks, land to live and farm on and good wages for a normal Aztec civilian. The bravest warriors were also given equal standing with the nobles and the priests, and the highest honour was to be part of the Eagle and Jaguar warriors, the elite of the Aztec army. The Aztec warriors helped form a huge undefeated army that was the catalyst in expanding the Empire until the Spanish conquistadors overpowered them with betrayal. The middle class was the largest group in Aztec society, and provided a variety of jobs and careers in the Aztec world. The middle class Aztecs were commonly lawmakers, merchants, feather workers, potters, weavers, sculptors, painters, goldsmiths, and jewellery crafters. The merchants or Pochteca acquired goods that were in demand or needed and sold them in the Aztec markets. Sometimes, the merchants had to travel far to acquire some of their wares, and typically the more far flung the more variable the items. Some Aztec merchants even acted as spies in the foreign market places, which was the centre of the daily activity of the Aztec civilian. The merchants important job in society made them a highly exclusive class, which was usually born or married into. They had their own area where they lived in the city, and were thought of well by most of the Aztec people, the god Yacatecuhtli even guided them through their dangerous journeys for trade. The Aztecs of the lower class were free and led simple lives with their families, and while they were lower class their quality of life was not bad at all. Usually the lower classes would make up the farmers and the hunters, other lower class Aztecs were weapon makers or construction workers, that sold or made goods or services that the Aztecs needed in their daily lives. It was possible though for a commoner to become a noble through marriage or bravery in war, just like in modern life there was plenty of opportunity to change ones path in the Aztec society. 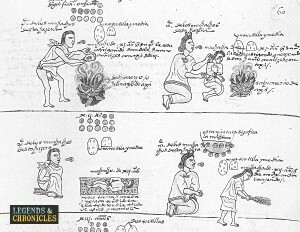 The main economic activity of the Aztecs was that of agriculture and as young boys, Aztecs already helped out in farming. The Aztecs grew lots of corn, which was easy to grow in their climate and was a staple of their primary diet. The Aztecs would also farm peppers, beans, onions, tomatoes, and cocoa beans, all of which were ideal crops for the hot Aztec summers. For fun and food, the Aztecs would also hunt, and the local animals such as deer, rabbit, turkeys and dogs, were all game for hunting. Aztec servants worked for the nobles but they were free to own property and slaves. Servants were allowed to lead simple lives with their families and they were also allowed to have an additional business to help support their families. Aztec slaves on the other hand were property of the nobility and had minimal rights. Slaves could be sold up to three times and after that were offered as human sacrifices to the gods, so life was hard for the Aztec slaves, and it would be up to them to ensure they worked hard to not be sold three times. Life in the Aztec world was varied and the jobs on offer were often dictated by your nobility. The higher your stock in Aztec society the more choice you had, but even for the lower classes and servants, life as an Aztec was not to bad. You could farm, own your own land and decide to be a mighty warrior. Whatever job an Aztec citizen took in life they were still sure to enjoy the regular Aztec traditions.